REUTERS/Adrees LatifVehicles at a car dealership are set afire in Ferguson, Missouri early morning November 25, 2014. Missouri Gov. 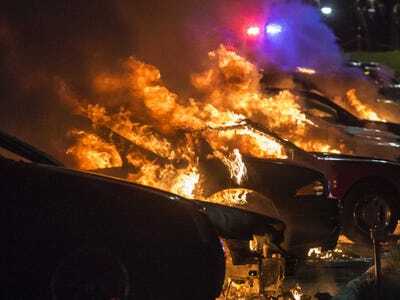 Jay Nixon (D) announced on Tuesday that he plans to deploy more than 2,200 National Guardsmen to the Ferguson region the night after violent protests rocked the city. “No one should have to live like this. No one deserves this. We must do better and we will. This morning and into this afternoon, I met with Guard and law enforcement leaders. All agreed that the violence we saw in the area of Ferguson last night cannot be repeated,” Nixon said at a press conference. Nixon was strongly criticised by Ferguson Mayor James Knowles and even his own Lt. Gov. Peter Kinder (R), who said the governor should have deployed more National Guard troops to Ferguson Monday night, when protesters set buildings and cars on fire. More than 60 people were reportedly arrested in those demonstrations. However, Nixon said Tuesday that more than 700 National Guard troops were in fact in key locations throughout the night — though he admitted more were still needed to maintain order. The protesters took to the streets after a grand jury revealed it would not indict Darren Wilson, a white police officer who shot and killed an unarmed African-American teen in August. Wilson said he acted in self defence but the demonstrators and Brown’s family argue the killing was criminal.